A solitaire game is played on a 4 × 5 board, representing the Capital of a Banana Republic with a 3 × 3 Palace enclosed by double walls. I am the Incumbent Monarch (I) and start on the space I. Eight guards occupy the remaining spaces in the Palace. You are the Usurping Rascal (U) and start on the space U just outside. A bloodless coup, with my cooperation, is executed as follows. 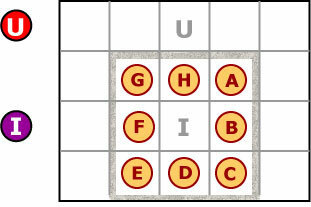 In each move, if a person X is between a person Y and an empty space on the board, along a row or a column, then X may be pushed by Y into the empty space, while Y moves into the space just vacated by Y. The change of regime is completed when you are in space I and I am in space U, with each guard returning to his or her starting space. Show how this can be done in ten moves.